With All-NBA phenoms Chris Paul and Blake Griffin, it’s no surprise the Clippers possess the most efficient offense in basketball. Paul has been a magnificent floor general for years, and Griffin continues to evolve into one of the game’s best scoring forwards. But with the play of DeAndre Jordan this year, the Clips have added another dominating component that puts them over the top: the most proficient rebounder in basketball. When Jordan is able to recover a missed shot on the offensive end, his best option is often to immediately try to put it back in the goal himself. Not coincidentally, the NBA leaderboard for putbacks looks a lot like the offensive rebounding leaderboard, and Jordan’s 114 putbacks this year were third-most in the NBA — behind Andre Drummond (167) and Enes Kanter (124). During the regular season, Jordan converted 373 close-range field goals, including 252 dunks. He ranked third in the league in close-range production and matched that elite yield with an equally impressive efficiency level. Out of 38 players who averaged at least five shots per game within five feet, Jordan ranked third in field goal percentage by converting 74 percent of those attempts. His offensive game may not be fancy, but he blends volume and efficiency in the restricted area as well as anybody in the league. As for the other end of the floor, just as his offensive boards breathe new life into seemingly failed possessions, his defensive rebounds prevent the opponent from achieving that same kind of reincarnation. Among qualified players, nobody in the NBA pulls down a higher share of available defensive rebounds than Jordan, who posted a ridiculous 32.3 percent defensive rebounding rate. In addition to dominating the glass, he’s also a volume rim protector who defends more shots than anyone else in the league.2 And while he doesn’t disrupt opponents’ efficiency as much as guys like Roy Hibbert do, on average he still reduces the likelihood that an opponent’s shot will find the bottom of the net. Jordan might not be the best defensive player in the league, but he very well could be the most important. Those rim protection skills are really valuable, but make no mistake: His rebounding should be the top bullet point on his résumé as he tests free-agency waters this summer. Simply put, every basketball team in the world needs guys to clean up the glass, and there are few, if any, players in the league you’d want chasing down rebounds more than Jordan. During the playoffs, he’s gained a reputation as the guy who shoots crooked free throws in between talking horse commercials, but Jordan’s obviously much more than that: Few players in the league breathe fresh life into his team’s offense more than him, and nobody turns defense into offense more reliably than he does. While his rebounds might only show up as one number in a box score, their value extends way beyond a single data point. As we’ll find out this summer, they’re probably worth something closer to eight figures. Drummond was third. Amazingly, he rebounded 76 misses from … Andre Drummond. 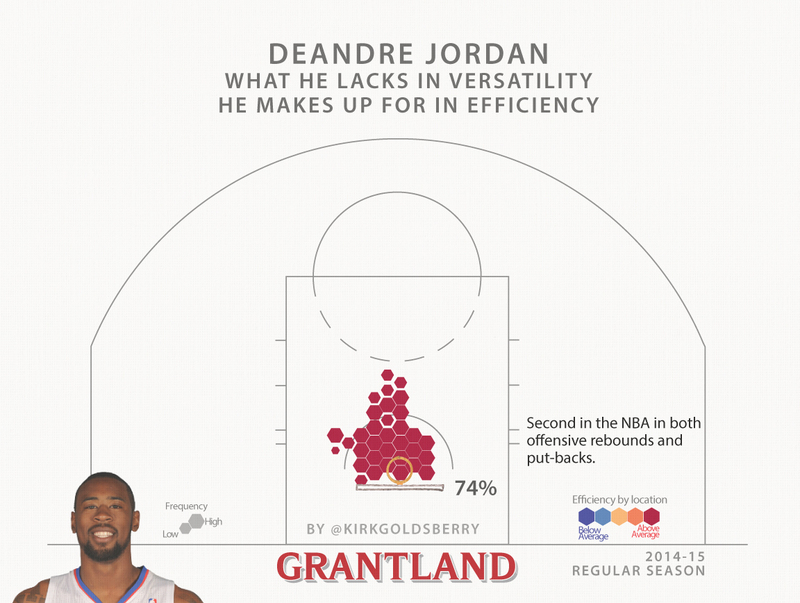 According to the player-tracking database managed by the league, Jordan faced 1,182 shots during the regular season.